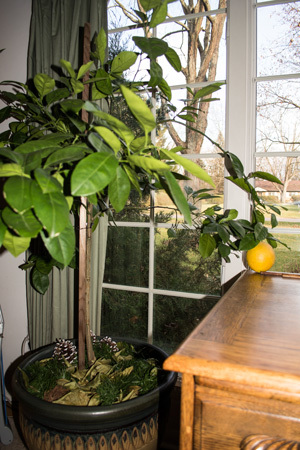 Watching the growth of this first orange on our orange tree parallels our Living Building experience. We’ve spent about two years working on house design. Since this is the third house we’ve built – and we’ve completed remodels on two houses, ranging from minor to huge – we’ve become quite picky about the details. Probably driving the architect a bit batty . . . But we now have construction documents ready to go. Hooray! And the right weather for all the high-tech stuff we need to use in order to achieve net-zero energy? Nope, not till spring. And the real slower-downer here is vetting of materials against the red list. Wow, what a job! Like our orange, which has been growing larger and orang-er over the past eight months or so, we’ll be working away at this task for some months yet. Thank you, Eric Doyle, for your organization and effort, leading us on to the end. Maybe we’ll now see how that orange tastes. Or maybe just another week or two or three . . .